Hydroponics, also known as botany. This is where hippie botanists laze around growing rainbow weed in a THC-induced coma, oblivious to the Chef's desperate pleas for produce. Pile of beakers and other Chemistry supplies. The APC for this room is located in catering storage. The power is supplied via a cable through port aft solar maintenance via catering storage. Pile of beakers and other Chemistry tools. In the rare case that botany finally snaps out of their weed trance, one of the chutes leads directly to the kitchen. The outer ring of the conveyor belt system can be used for deliveries to QM or chemistry. Hydroponics may also receive crates (typically honey production kits) on their cargo pad or M.U.L.E. beacon. A UV Lamp and a Botanical Mister that'll help water your plants--and more! This room has no air vents. In fact, none of the rooms on the NSS Destiny have air vents, but at least all these greens could make you some. Or not. The APC for this room is located in catering storage, in the maintenance room the door near the couch goes to. This room has no air vents. In fact, none of the rooms on the NSS Clarion have air vents, but at least all these greens could make you some. Or not. The APC for this room is located in the room with all the chemistry equipment, right outside the door. In the rare case that a Botanist finally snaps out of their weed trance and realizes that the world would be a much better place if everyone got to enjoy local, hand-raised produce, there is a table where botanists can directly deal the good stuff sell/distribute fresh fruits and vegetables to all the public, including the Chef, like a little farmer's market. Hydroponics may also receive crates (typically honey production kits) on their cargo pad or M.U.L.E. beacon. This room has no air vents. Better hope photosynthesis will give you the air. The APC for this room is located just outside the northern door, in the maintenance tunnel above. Hydroponics, also known as botany, which for some reason connects to the main hallway via an empty featureless hall. This is where hippie botanists bring back the Space 60s by lazing around growing 'shrooms and going on wicked trips. In another station, the Chef would be close to helpless, but not here. Since they have a switch in their Kitchen that lets them open and close the Cafeteria entrance into Hydro, they're free to grow some weed instead their own ingredients. 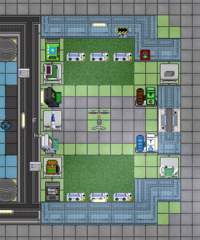 In the event one of the botanists finally escapes the horrific roguelike dungeon crawl monsters trying to beat the crap out of them, they have somes crates, a cargo pad, and a cargo transporter for sending produce for the QM to sell. Neither the airlock/hallway leading into this room nor the actual growing space have no air vents. If anything gets breached, things are going to go like Silent Running. 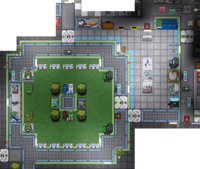 The APC for the weird empty hallway is in the empty green floor tile room, with the two grey chutes. The APC for the space with all the windows, grass, and planting trays is in the little alcove to its right, with the PlantMaster and all the chemistry machines. Hydroponics, also known as botany, located in the east/stern parts of the station, just below the Bar. This is where hippie botanists and other casualties of the various wars of the Space 70s attempt to readjust to civilian life by growing various food crops and their wacky heirloom varieties for the Chef and the Bar patrons to enjoy. Paper and various random writing implements. This room has no air vents. Terrible. 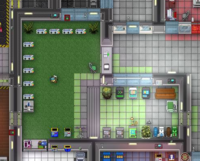 The APC for this room is near the top left corner of the patch of space grass. Hydroponics, also known as botany. While much of it is near the Bar, the actual entrance into this place is in the northwest parts of the station, a little bit past Crew Quarters. This is where hippie botanists attempt to relieve the Space 60s by growing tons and tons of rainbow and omega weed, so they can spread the Gospel of the Ganja. Not one, but two (!) UV Lamps. In Hydroponics may also receive crates (typically honey production kits) on their cargo pad. There's also a little table looking into the Kitchen, so that the Botanists give the Chef some "produce", as well as a mutually shared disposal chute that has its own airlock into it for some reason. This room has no air vents. All for the better, because that means they can make this place into a hotbox if they keep the doors closed. The APC for this room is in the northeast corner of the main growing area. Ain't no one gonna mess with Botany's electricity but the Botanists. Hydroponics, also known as botany, a garden of sorts above the Bar. This is where hippie botanists take an misplaced space too far and attempt to grow the dankest "sea weed" they can. 9 hydroponic trays and a wrench to move them around. Various Chemistry supplies, such as beakers, reagent scanners and a ChemMaster. A cute and adorable sea bee. There's also a little table looking into the Kitchen, so that the Botanists can give some "sea weed" to the Chef for "sushi". To the left of here, there's a little side room with crates of bottles and other Chemistry gear, a minisub bay, and the Bar Office, the shared living quarters for the Chef, Barman, and Botanists. This room has no air vents. Natural seaweed doesn't have them. The APC for this room is near the door to the center hallway, above the couch. Smack-dab in the middle of the region, near Arrivals is land called Hydroponics, the breadbasket of Civilian Republic of Civilechia, and, by extension, the entirely of Atlas. Here, farmers grow crops such as wheat, tomatoes, and chili to feed its burgeoning food industry and opium and various types of cannabis to supply its equally rampant legal drug industry. The botanists can also receive crates (typically honey production kits) from the Cargonians on their cargo pad. There's also a little table looking into the general station and a cute little credits transfer device, so that the farmers can easily sell their produce to the locals and make a good, fulfilling living. This room has no air vents, as agreed on by the farm's charter. This page was last modified on 13 March 2019, at 16:20.